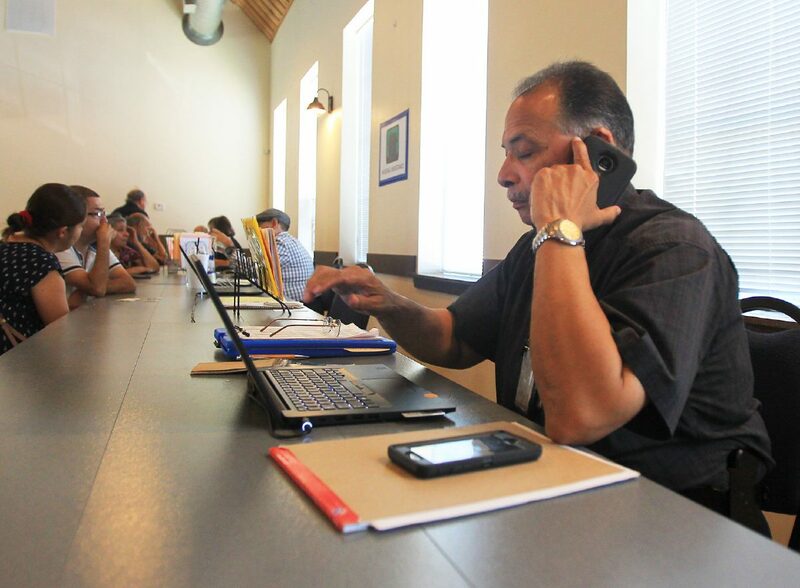 FEMA worker Joaquin Feliciano enters data into his computer as applicants apply for disaster relief at the FEMA Disaster Recovery Center at the Old Church Winery on Friday, July 20, 2018 in McAllen. Residents affected by the June floods should apply for Federal Emergency Management Agency assistance by Sept. 4 — the deadline to qualify. Heavy rainfall in late June flooded parts of Hidalgo and Cameron counties, up to 18 inches of rain in areas of Hidalgo County, resulting in a disaster declaration issued in July. FEMA has approved 4,415 applications thus far resulting in about $26,834,566 in housing and individual assistance to be disbursed to those affected by the floods. FEMA also opened disaster recovery centers in July, which remain operational from 9 a.m. to 7 p.m. Monday through Friday in Weslaco, Mission and McAllen. The centers are also open from 8 a.m. to 3 p.m. on Saturday. Representatives from Texas Legal Rio Grande Legal Aid, the Small Business Administration and the Texas Department of Insurance are also available at the centers to field questions from residents or business owners impacted by the disaster. The SBA approved 293 loan applications in three affected counties, which amounted to $11,573,200, according to a news release. Those affected by the floods may apply for assistance by calling FEMA at (800) 621-3362 or registering at www.disasterassistance.gov.